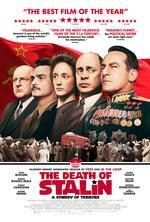 "THE DEATH OF STALIN is superbly cast, and acted with icy and ruthless force by an A-list lineup. There are no weak links. Each has a plum role; each squeezes every gorgeous horrible drop." "Iannucci's take-no-prisoners directorial style is perfect for this blackest of farces." "The script feels like a great writers-room comedy, where only the leanest and meanest bits stay, and the most startling and intriguing ideas persist. It functions comedically and historically — the jokes have something to say about power."